Pink Himalayan Salt naturally contains an incredible selection of 84 different minerals and trace elements essential to the human body for optimal health and vitality. Himalayan salt contains no chemical additives and is not processed in any way, making it by far the top choice among the various types of salt available on the market. Traditional table salt that you would typically find in most supermarkets is composed of roughly 97% sodium chloride. The other 3% consists of various chemicals designed to prevent caking (clumping together) and improve the flow of the salt when poured or shaken. The salt is then bleached and processed under extreme heat which changes the chemical structure of the salt and destroys the essential trace minerals that exist in the salt’s natural, raw state. And therein lies the problem! The human body needs salt because of its rich mineral content which has now been destroyed and removed as a result of all of the chemical processing. As if that weren’t bad enough, many commercial salt processors then treat the salt with hazardous substances like aluminum hydroxide, which is used to prevent the buildup of moisture. All this unnecessary processing takes away the positive benefits and “life energy” of salt for the human body and leaves the consumer with an un-natural mixture of sodium chloride and chemical additives that is extremely difficult for the human body to break down and metabolize. The body must sacrifice tremendous amounts of energy and cellular water in order to neutralize the damaging effects of the salt. The inability of the body to effectively neutralize these toxic chemicals and substances can result in numerous conditions such as cellulite buildup in undesirable areas, arthritis, gout, kidney and gall bladder stones, and elevated blood pressure. As a result of all this, many consumers have turned to other types of salt like “sea salt” for their everyday salt consumption. While it is true that sea salts usually have a few additional minerals not found in regular table salt, it is also sadly the reality that far too many of our oceans and lakes are polluted with toxic poisons like mercury, PCBs, and dioxin. In addition, over 85% of all sea salt processors are using refining processes similar to those outlined above in their production of the salt that they sell to consumers. As a result, sea salt isn’t much better health-wise than traditional table salt. 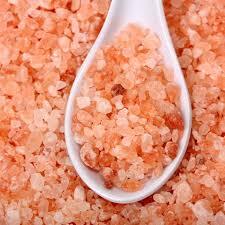 Pink Himalayan Salt is mined from deep below the surface of the earth, often at depths of a mile or more underground. The rich mineral content of Himalayan salt gives it a unique and vibrant pink color. Himalayan salt is not degraded in any way through chemical processing or bleaching. Nothing is added! Nothing is taken away! Use it in all of your recipes just like you would use traditional table salt! It is also excellent for use in an oral rinse for sore throats, tooth aches, and the like. It is theorized that, as a result of its rich mineral content unlike other salts, Pink Himalayan Salt does not elevate blood pressure and has the ability to regulate fluid balance and naturally stabilize blood pressure at a healthy level for the human body. Pink Himalayan Salt has an endless supply of positive health benefits, including: boosting energy levels; increasing the absorption of food; promoting vascular, respiratory, and sinus health; decreasing swelling of the mucus membranes as a result of allergies, asthma, or other environmental pollutants; preventing muscle cramps; promoting bone health and strength; regulating healthy sleep patterns and mood; supporting a healthy libido; enhancing overall immune system function; stabilizing heart rate and blood pressure; and reducing excess acidity and balancing pH in the body’s cells (which, as many researchers know, is extremely important because most diseases and illnesses thrive in an acidic state and cease to exist in an alkaline state). ALL OF THESE BENEFITS MAKE HIMALAYAN SALT THE IDEAL CHOICE FOR FITNESS ENTHUSIASTS, BODYBUILDERS, OR ANYONE LOOKING TO IMPROVE THEIR OVERALL HEALTH AND WELLNESS! It is always essential that we as human beings listen to our bodies first and foremost. When you find yourself craving salty foods, it’s your body’s way of letting you know that you need minerals, not just sodium chloride (and assorted added chemicals). The human body needs an abundant supply of minerals in order to function at optimal levels, and Pink Himalayan salt is the perfect way to naturally feed your body what it needs to perform at its peak! This article re-printed from Jesse Starrick of Himalayan Holistic Salts LLC.